Another smartphone-operated drone has been launched by Parrot. It is the Bebop Drone that has appeared with many advancements put together in a smart, strong and tough built. It can be maneuvered through a smart phone or an iOS. Get a glimpse on its features to know if it can make your choice. 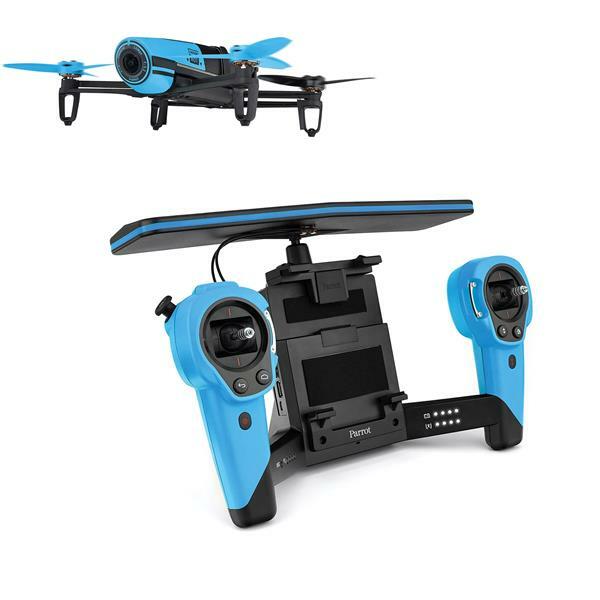 Parrot has been launching a series of smartphone-operated drones, among which the Bebop came up with a range of latest improvements after the installation of AR.Drone 2.0. and this time this change was brought to the camera, giving the device a longer range, gifting the device with a joystick-based controller as well. Keeping the same spirit up and running like every Drone model from Parrot the Bebop goes up and start running within minutes. Once you install Parrot's FreeFlight 3 app on your Android, iOS, or Windows device trying it in indoors, you can attach the protective propeller hull and take the flight off. The Bebop Quadcopter Drone is built on a feather-light ABS that has been reinforced in its structure weighing about 400g. This was intentionally done to ensure the safety of the robust Parrot Bebop Drone. They have taken every cautious step to prevent a drastic damage in case the drone collides with any hard object. They made it sure that the propellers stop automatically in such cases and save the device from further damage taking place. There is also an emergency mode that lands the drone immediately to the ground. The GPS system clubbed with the Return Home function turns the Bebop drone back to its take-off point easily. To give it a final layer of protection, the EPP hulls are included in the pack. Developing further on the technology they have used for Parrot AR.Drone 2.0 onboard computer, they have made the Bebop Drone navigation 8x times more powerful than before. Featuring a quad-core GPU, a P7 dual-core CPU, and back up of 8 GB Flash Memory, it is all a new model packed with the latest technical blessings. Each of the components is fixed on a magnesium shelf which works like a radiator with a high end electromagnetic shield. This Bebop Drone runs on Linux where they have kept the option of SDK to make it all easy for the Developers. The Bebop Drone is packed with a MIMO Wi-Fi connection: that works on two dual-band Wi-Fi antennas compatible to both 2.4 GHz and 5 GHz MIMO frequencies. It can now generate its own Wi-Fi 802.11 network based on the level of network interference and there the required or preferred frequency level can be selected. Each and every parts of Bebop Drone are made removable to make it ready for assemble as well as dismantling while packing it for a transport. The optimal stability has to be in place without any compromise with the maneuverability. So the Bebop Drone has been built up with a system wherein it keeps analyzing the data from numerous sensors through an automatic process. For this they have incorporated a 3-axes accelerometer, a magnetometer, a gyroscope, and one ultrasound sensors each of them having an 8 meters reach, along with a pressure sensor and a vertical camera which help in tracking the speed of the device. The Bebop Drone comes with a 14 megapixel ""fisheye"" camera, recording the pictures and videos spread over in a 180° field with unmatched picture quality. 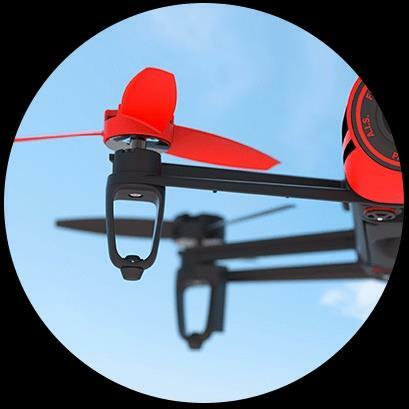 They have enabled a full-digital image stabilization technology that makes the Drone undoubtedly stable with clean and clear aerial footage irrespective of its movements. The lens are Splash and dust proof which brings down the liability of cleaning them every now and then. 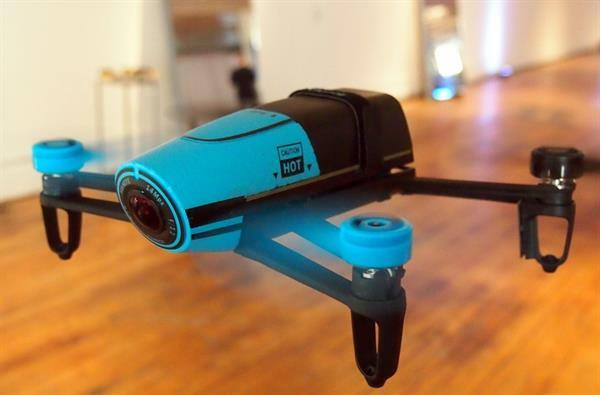 In contrast to the action cameras where you get horizontal distorted lines, the Bebop Drone camera keeps them straight and the horizon doesn't look curved any longer. The Parrot Bebop Drone has a free piloting application named, Freeflight 3 ispecially made for Android and iOS Smartphones and tablets. The application is easy to use and it has has been developed in such a way so that the pilot can simply focus on the flight navigation rather than the technicalities of its app. Once you are there on the welcome screen, the pilot get access to the functionality of Piloting, photos/videos, and the amazing Cloud "Pilot Academy", its altitude and speed, and of course to the piloting mode. The FreeFlight includes a fun features like one-touch Flip! 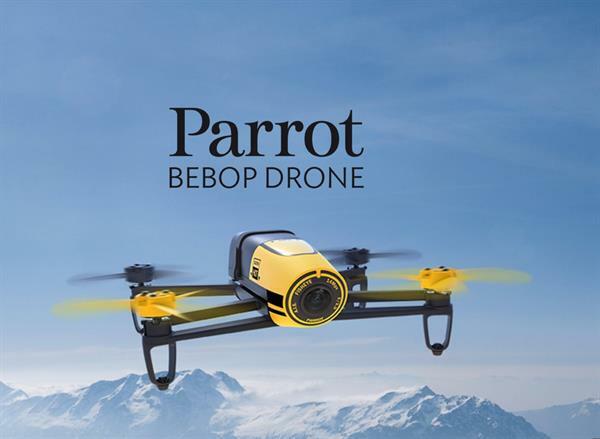 The Parrot Bebop Drone is a handy and portable device that has a good range of functionality. Though made quite tough and sturdy, that has kept the option open for user repairs in case of serious damages. It can monitored and navigated through a smartphone or tablet and with the Skycontroller as well. It is stable with a 1080p video capacity. You can try it indoors too. Has the ability to perform in aerial rolls and flips. Uncompromising JPG and Raw image capture quality. The Skycontroller adds to the price an extra amount of $400 if purchased along with the Bebop or else it goes to $500 as a separate device. It wasn't that stable against the wind, and the batteries timed out in less than 11 minutes. The flight time was very restricted. Gets expensive with the huge Skycontroller. Indoor video footage couldn't drop out the noise. As a durable, compact, user friendly quadcopter, the Parrot Bebop Drone also gathers appreciation for capturing good quality video and photos. Though the insufficient Battery life, a moderate performance and its price tag holds it back from making it a first choice, sstill it has a set of good reasons to be given a positive thought while going for one.